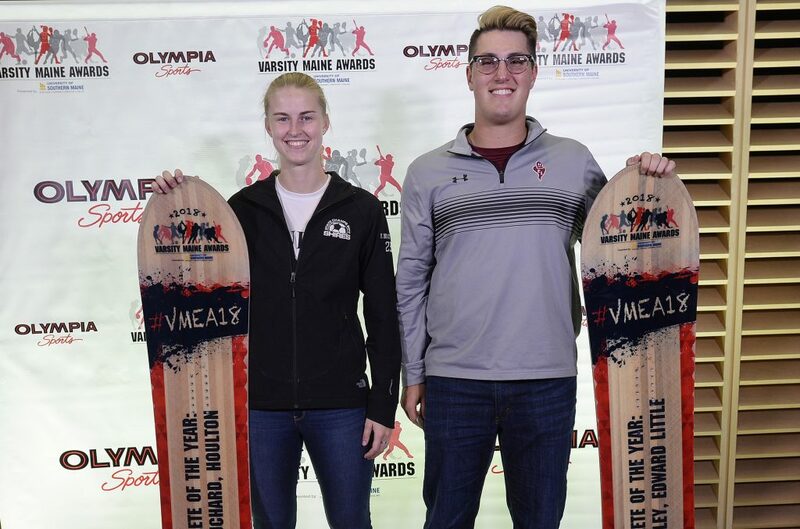 Kolleen Bouchard of Houlton and Grant Hartley of Edward Little are the 2018 Varsity Maine Athletes of the Year. 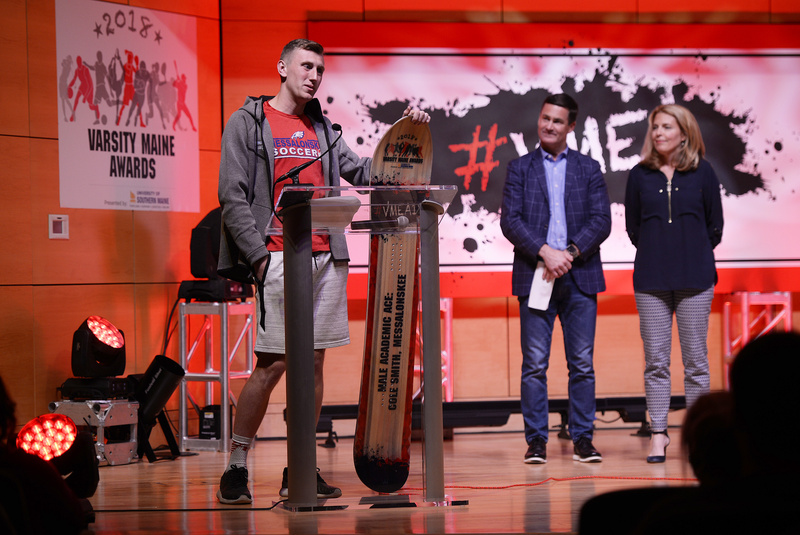 Cole Smith of Messalonskee High School, right, shares the stage with presenter Brian Corcoran, CEO of Shamrock Sports, after Smith won an Academic Ace award on Tuesday during the 2018 Varsity Maine Awards at Hannaford Hall on University of Southern Maine's Portland campus. 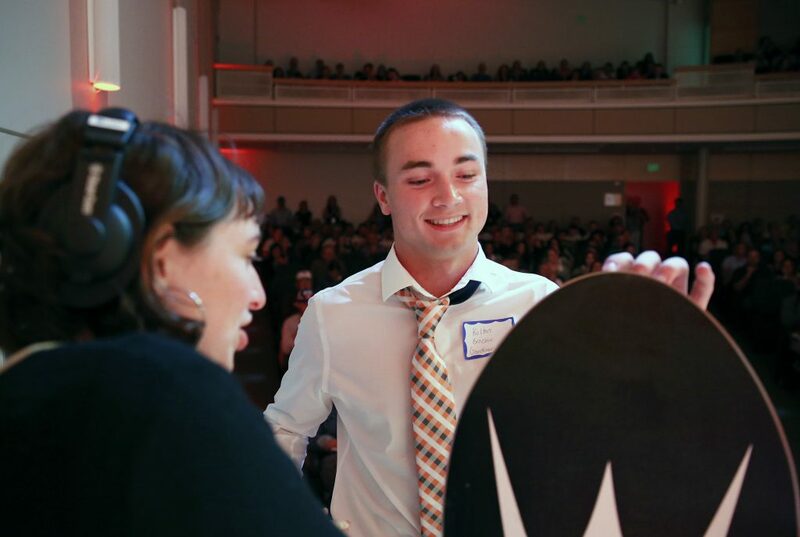 Kolton Brochu of Gardiner High School accepts the award – a snowboard – for the category Beyond the Box Score on Tuesday at the 2018 Varsity Maine Awards. 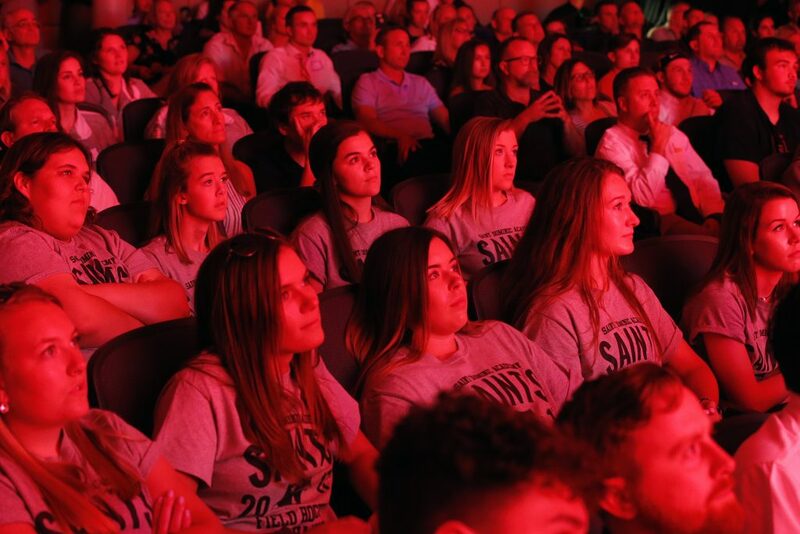 Members of the St. Dominic field hockey team watch a photo presentation of Varsity Maine athletes from the 2017-18 school year on Tuesday. 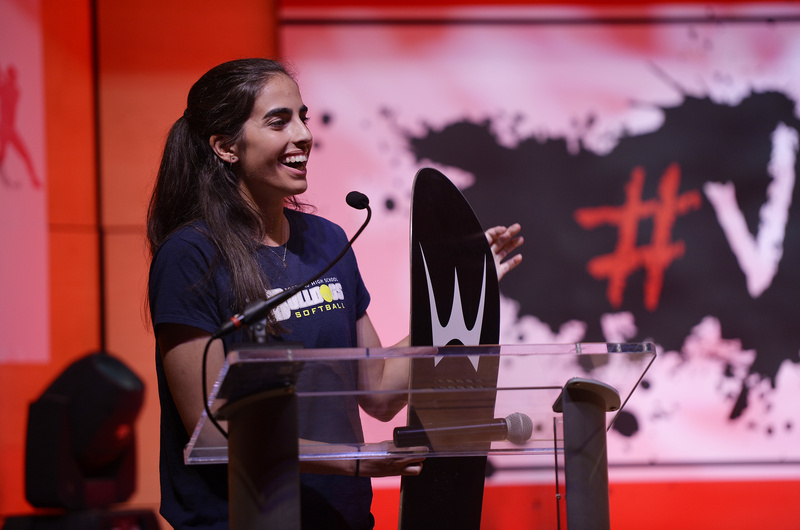 The group later gathered onstage to accept a Team of the Year Award for the fall season. St. Dominic Academy field hockey coach Brian Kay accepts a Team of the Year Award during the 2018 Varsity Maine Awards. 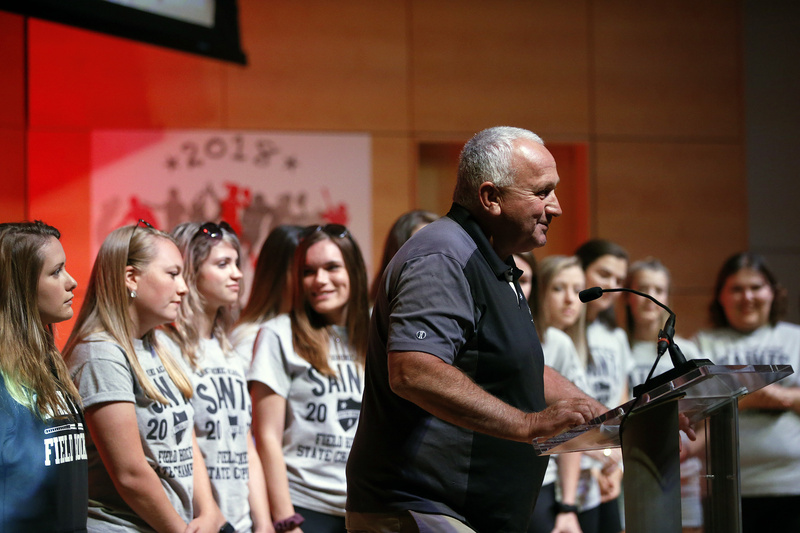 St. Dominic Academy field hockey team gathers onstage Tuesday to accept a Team of the Year Award. 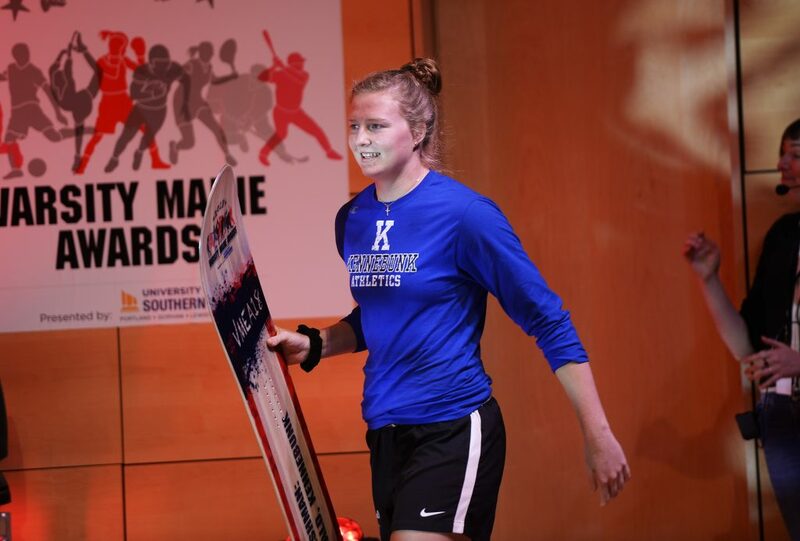 Jess Brown of Portland High accepts an Academic Ace award on Tuesday during the 2018 Varsity Maine Awards. 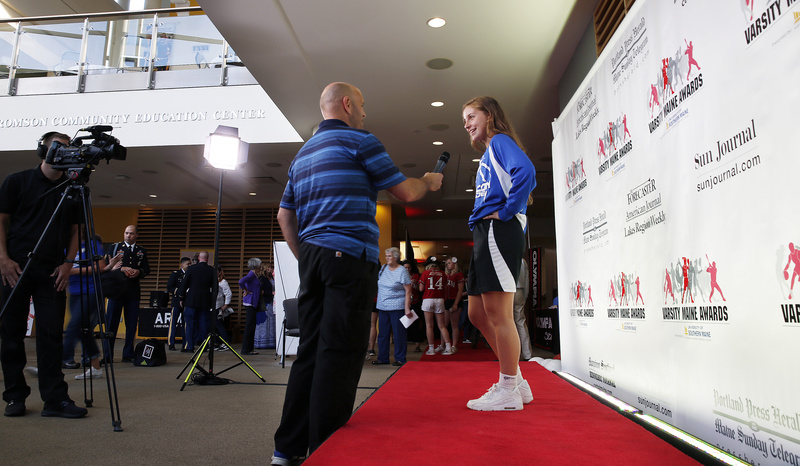 Basketball player Rylee Sevigny of Mountain Valley High takes questions from MaineToday Media social media editor Jim Patrick on the red carpet at the 2018 Varsity Maine Awards. 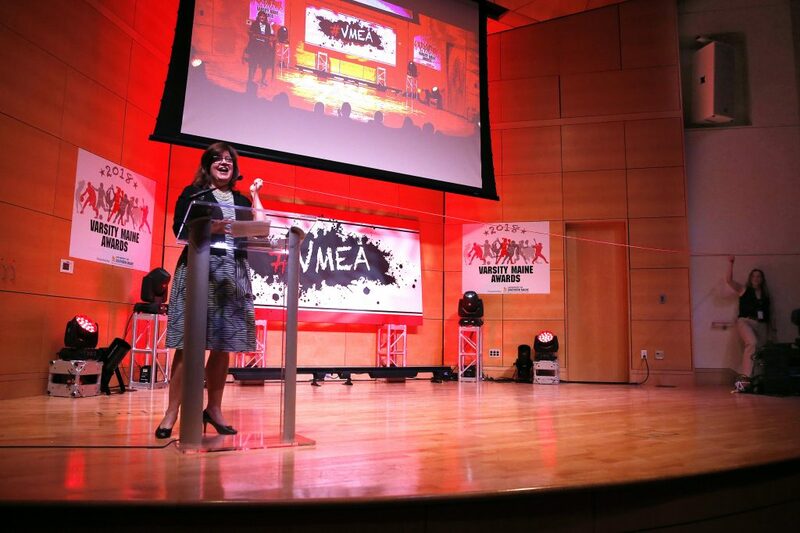 PORTLAND, ME - JUNE 26: MaineToday Media publisher Lisa DeSisto and sports writer Deirdre Fleming, far right, hold a length of rope across the stage to demonstrate the length pf presenter Kate Hall's record long jump. 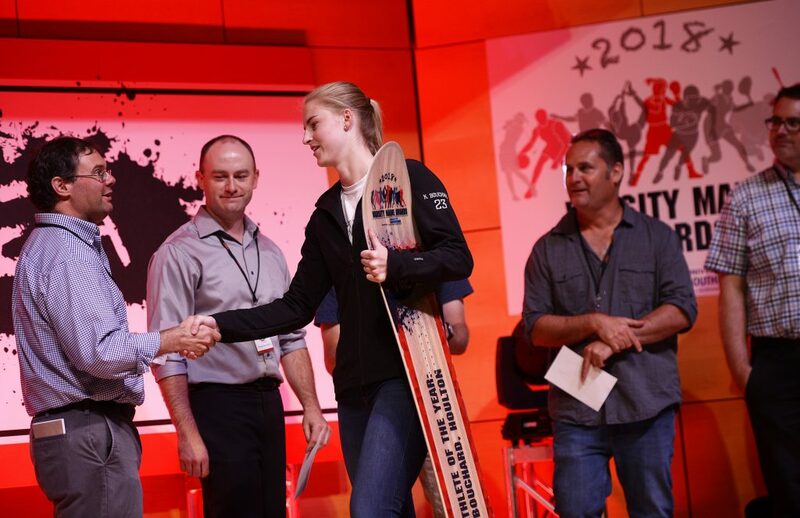 Emily Archibald of Kennebunk accepts the award for Fab Freshman. 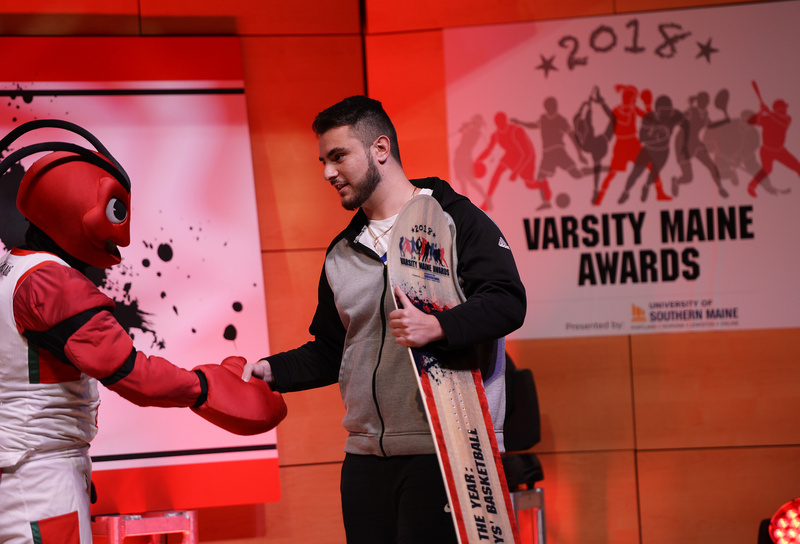 Biddeford boys' basketball Zach Reali is congratulated by Crusher as he accepts the award for Play of the Year (video clip). 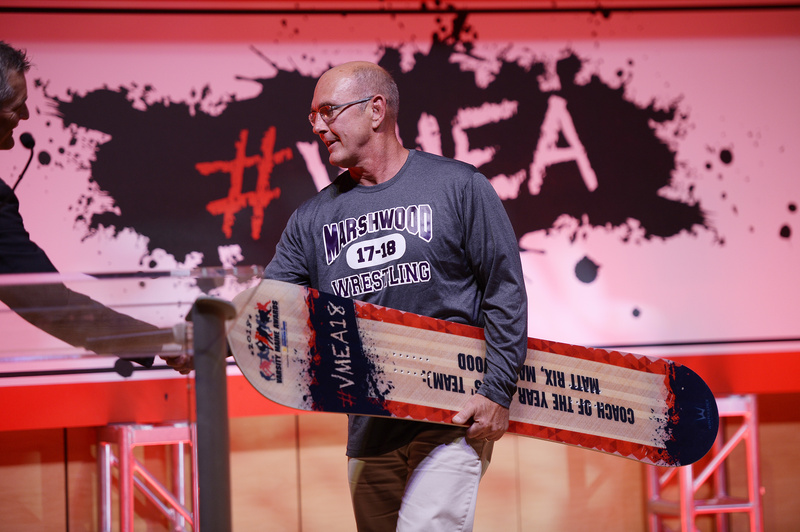 Marshwood's Matt Rix wins the award for Coach of the Year for a boys' team.  Skowhegan's Paula Doughty wins Coach of the Year for a girls' team. 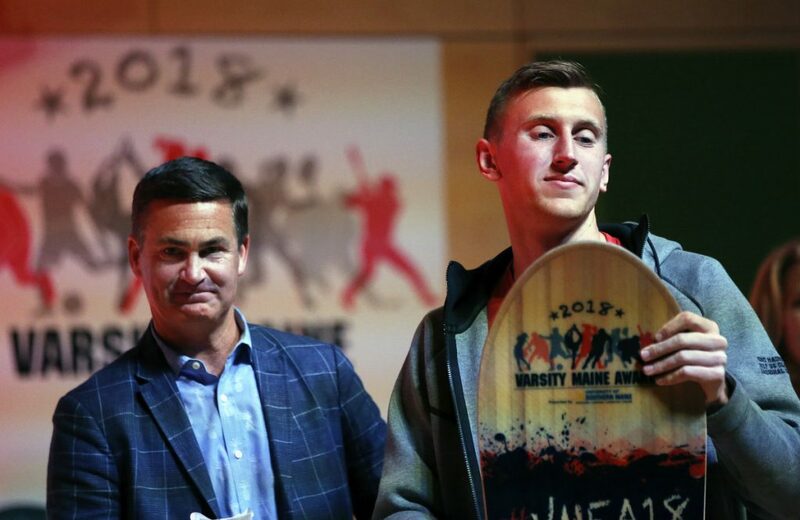 Grant Hartley of Edward Little was the Male Athlete of the Year. 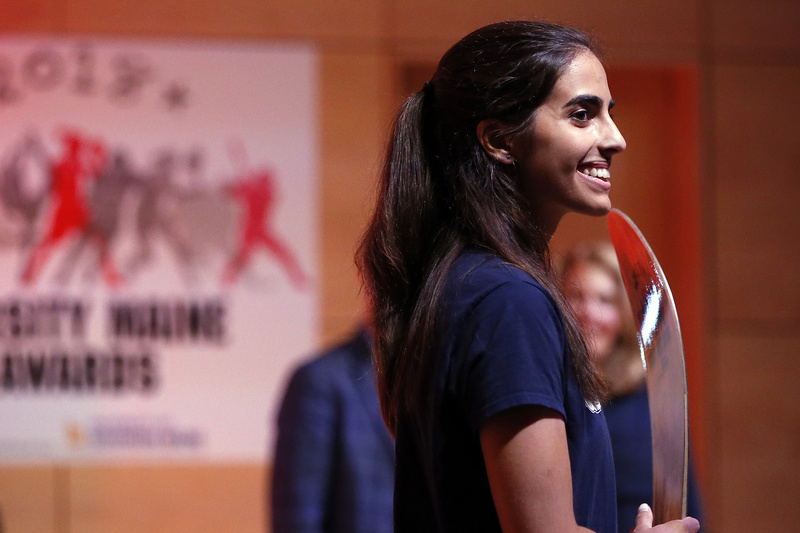 Houlton's Kolleen Bouchard was named the Female Athlete of the Year. 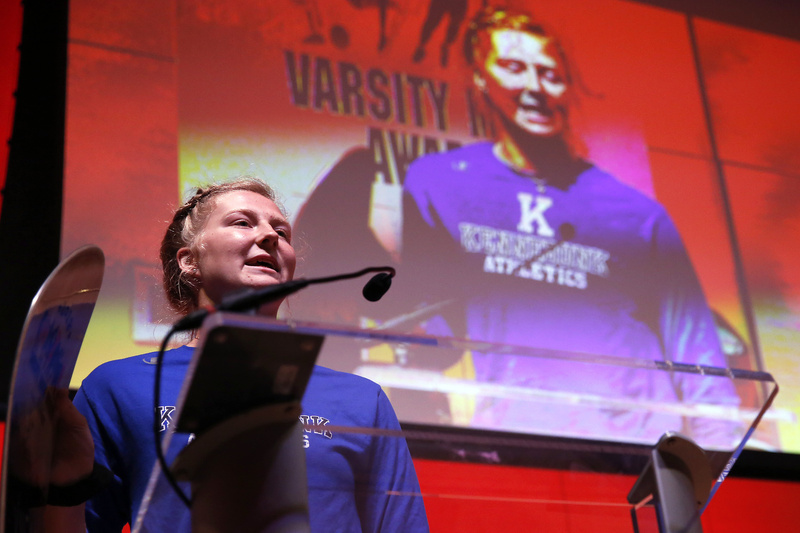 Kennebunk's Emily Archibald won the Fab Freshman award. 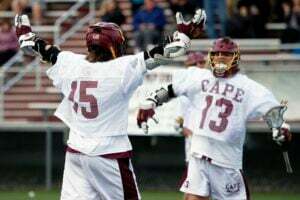 Cole Smith of Messalonskee won the Male Academic Ace award. 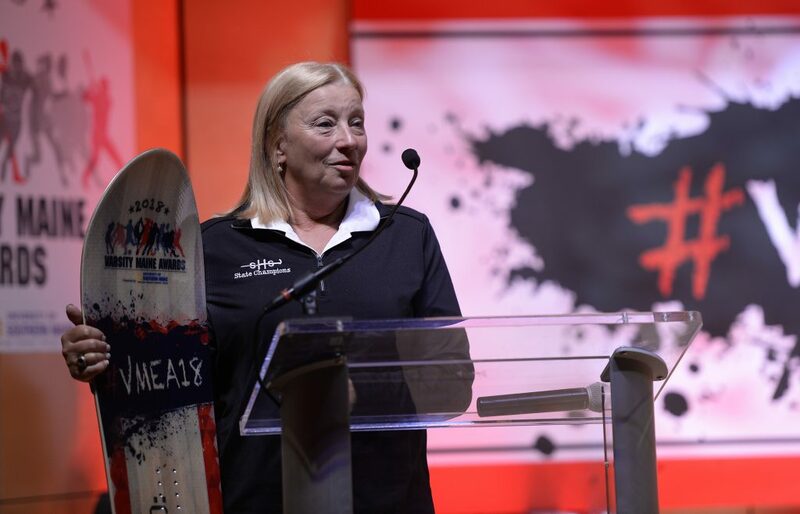 Jess Brown of Portland, won the Female Academic Ace award. 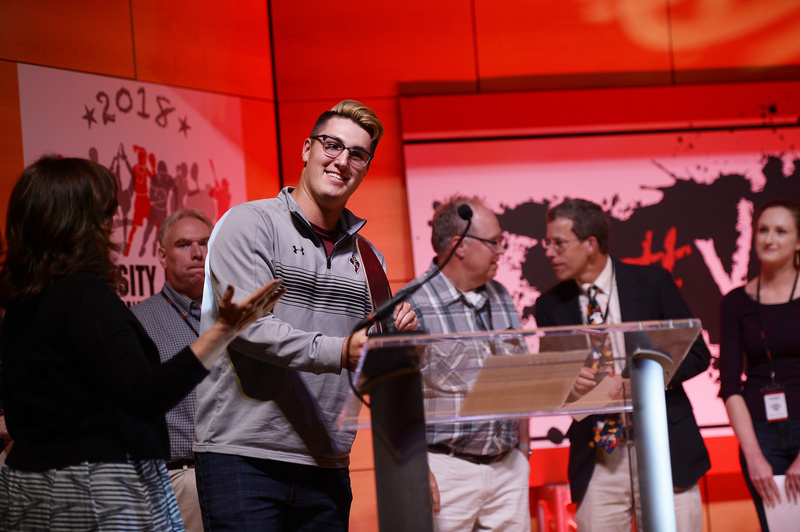 Gardiner's Kolton Brochu was awarded the Beyond the Boxscore award. Social media editor with the Portland Press Herald Jim Patrick, right, interviews members of the Greely/Gray-New Gloucester girls' hockey team before Tuesday's Varsity Maine Awards. St. Dominic field hockey won the Varsity Maine Award for Fall Team of the Year. 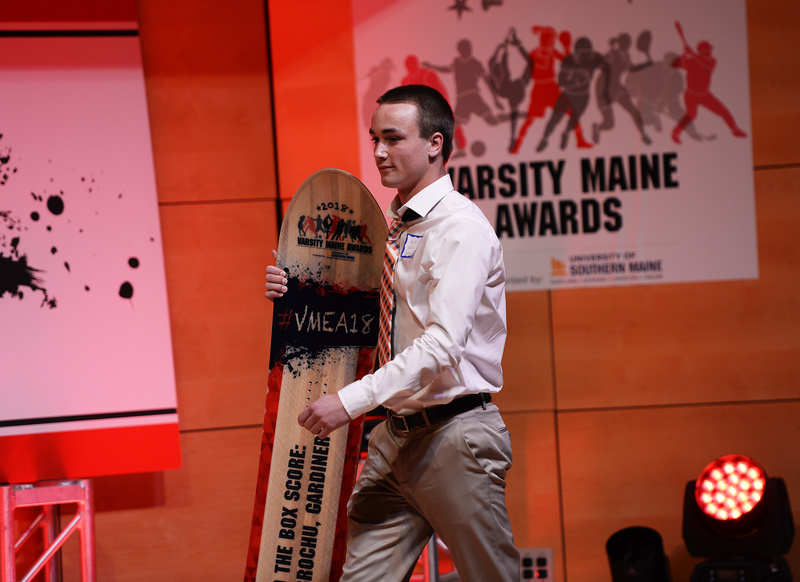 The Edward Little boys' basketball won the Varsity Maine award for Winter Team of the Year. 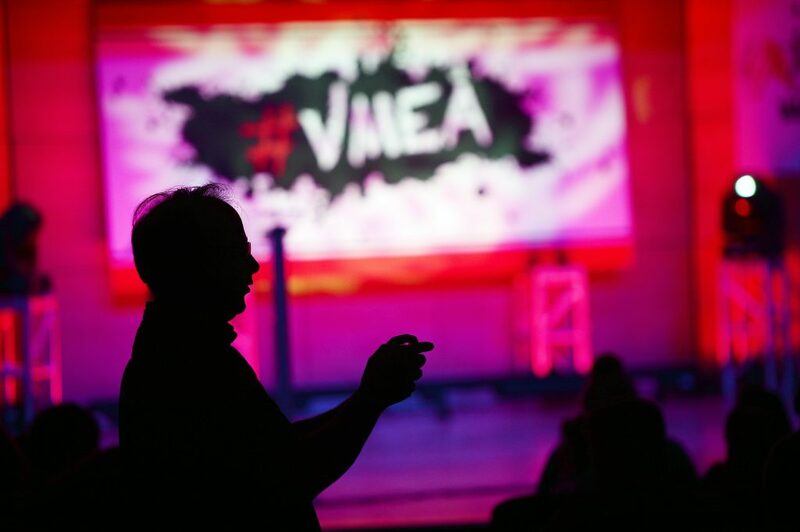 Press Herald reporter Steve Craig takes photographs before the Varsity Maine Awards.